Along the road, we often hear from blog readers who say, “You’ll be coming through my area — would you like to meet?” Often they offer dinner, or courtesy parking, or just helpful advice. We don’t get to accept all of those kind invitations, but when we have it has always turned out very well. 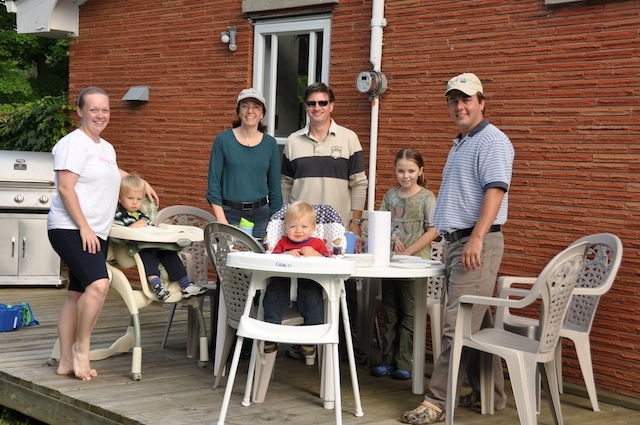 Such was the case today, when we met up with Jason and Angie, who live just about 20 minutes south of London. Jason has been reading our blog since 2005, when it was “Tour of America,” but until last week had never commented or emailed us. He and Angie full-timed for two years in their fifth wheel, then settled down for a short time while producing two children, and now are ready to get back on the road with their 2- and 3-year old boys. With that sort of history, there was little doubt we’d have a lot in common, so we happily accepted their invitation to come down for bratwurst tonight. A lot of the conversation was about what it was like to accept invitations from strangers via email. Jason already had “met” (virtually) our friends Leigh and Brian from their travels at the former 63flyingcloud blog, as well as many other people who blog while they travel. I was surprised to find how many people we knew in common. 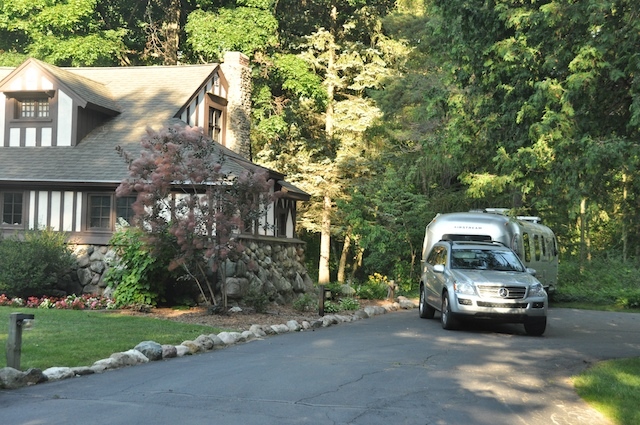 This RV blog community is one of those in which you can assume quite a lot about the person at the other end. Of course, it’s easy for people to “know” us, since they’ve read a lot about us, but it’s also possible for us to know that people who read this blog are probably like-minded in many ways. They love travel, meeting people, socializing, sharing stories, learning, and tend to be very accepting of all kinds. That’s probably why we’ve always had good experiences when accepting courtesy parking or get-together invitations. We’ll probably see Jason and Angie again in the next year or so. They’ve put the house up for sale and will be departing for points unplanned as soon as it is sold. I’ve told them some stories of western RV travel in the hopes that they’ll come out next winter and join us at some point. Today the Can-Am RV guys added some additional — actually, quite a lot — support to our receiver hitch. It’s almost intimidating-looking now, although you can only see the new support by bending down beneath the rear bumper level. I was not concerned that the hitch as already reinforced would fail, but I was looking to get a little more weight transfer to the front axle, and distribute the overall load better. The photo at the right shows the extra support running beneath, before it was painted. 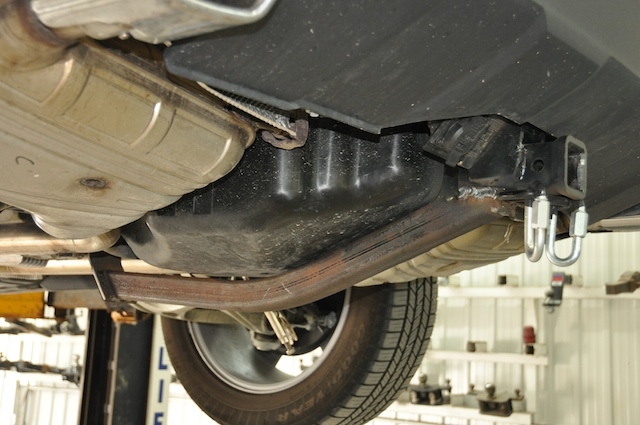 It takes away 2″ of ground clearance at that point but this is rear of the axle (not at the lowest point of the car), and the car has substantial ground clearance, so I’m not highly concerned about it. The only real issue is that if we ever have to remove that tank above it (which holds urea for the Bluetec system), we’ll have to cut the support member out. I doubt that will prove necessary. 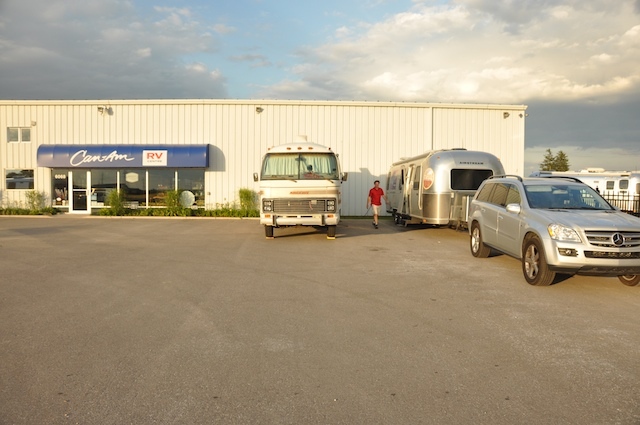 Andy Thomson of Can-Am RV took me out for a test drive and adjusted the brake controller while we were out. He reduced some of the boost on the Prodigy and raised the voltage setting, to give us better braking in panic stops. It feels slightly different when braking now, but still very good. Since the handling was already fine, I can’t say if this has substantially improved anything in that department. I plan to re-weigh the trailer tomorrow morning to see if it has changed the weight distribution on the axles. This wraps up our business in London, so we’ll be heading east again tomorrow and back into the USA. We are stopped in a rest area about 40 miles west of Huron, MI, for lunch. In an hour we’ll be crossing the border into Canada and dropping out of touch. In Canada, my cell phone and cellular Internet are outrageously expensive to use, and for the 48 hours we plan to be in the country it’s not worth getting the international option that Verizon offers. So this is my last chance to briefly post until we get back into the USA. We left Milwaukee in the morning on Sunday, with the only aim of navigating the busy highways through Chicago before holiday traffic got too bad. The drive was decent, and the trip was marred only by a minor mechanical glitch. We had stopped about an hour south of Milwaukee at the Mars Cheese Castle, a small tourist attraction featuring (surprise!) a lot of cheese for sale. Eleanor made the requisite purchases, of course. My habit is to always inspect the trailer at every stop. This prevents little problems from being big ones, because I occasionally spot something that’s not optimal and have a chance to fix it. This habit paid off on this day because I could easily see from 100 feet away that something was hanging down beneath the trailer. It turned out to be one of four straps that hold the fresh water tank in place. A bolt had stripped out and the strap was dangling. We weren’t able to effect a roadside repair, so Brett and I removed the strap entirely and saved the remaining good bolt from it. We also used the tank’s exterior petcock to dump about 3/4 of our fresh water supply on the pavement, thus lightening the load on the three other straps. I was glad that nobody spotted this, since it might have looked like we were dumping gray water on the ground and I didn’t want to have to explain ourselves to an angry property owner. I finally got far enough along on the Fall magazine that I was able to take most of Friday off and explore Milwaukee with the rest of the crew. With great anticipation, Brett and I headed over to Harley Davidson’s power plant facility to take the free tour. Foolish us. Upon arrival in the suspiciously-empty parking lot, we realized that it was Friday, July 3, and the factory was closed. Doh! Well, I won’t be seeing that attraction of Milwaukee, but there are many others. We headed over to downtown to see the Milwaukee Public Museum. This was a good choice. We’ve been to many museums in many major cities, and I can say that Milwaukee’s ranks right up there with the best of them. We spent most of the day and still hadn’t seen it all when the museum closed at 4 p.m.
Of course, to sustain a full day of museum-walking, one needs a decent midday lunch. 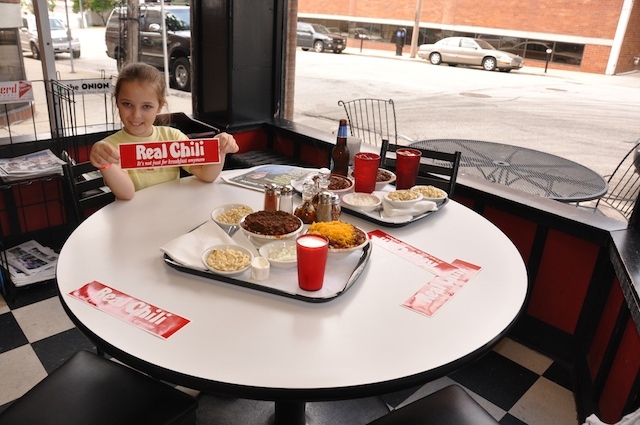 Brett suggested an old favorite of his, a place just across the river called “Real Chili.” This scored with us on four points: (1) good food; (2) new culinary experience; (3) low price; (4) friendly staff. I say that the culinary experience was new because I’ve never been to a place that serves only chili, and moreover I’ve never had chili with spaghetti in it. You go up to the counter and order the chili Mild, Medium, or Hot, and then specify if you want spaghetti, beans, or both. You can order “mixins” too: onions, cheese, jalepenos. It’s about $5. Refills are half price. That’s it. Dead simple, and seriously tasty. I wish I had more time to explore downtown Milwaukee. The architecture is widely varied and all interesting. There are lots of interesting shops, walks, parks, and the river area. We barely scratched the surface of this town. I can’t say we’ll be back soon, but not because it isn’t worth a stop. It’s more a matter of Milwaukee being not on the way to anywhere. That big puddle called Lake Michigan blocks the way east. Today we got up at 5 a.m. and headed back to Madison, to attend the final day of the International Rally. As is usual, about 1/4 of the Airstreams had already departed and there was a trickle of aluminum slipping away all day. But there were still plenty of people to make the flea market a big success, which was the reason for our visit. We set up a table of our merchandise (back issues, t-shirts, hats, aluminum tumblers, silver slippers, etc.) and hawked it all until our throats were dry. Emma was particularly good at promoting the tumblers, reminding everyone who came by that they were dishwasher safe. We sold every single one, and went to Madison’s “Dave’s Famous Barbecue” for the post-market celebration. There was a second Vintage Open House at the rally site, one to which the general public had been invited. We hung around for a few hours, having final visits with the friends that we likely won’t see for months, or even years. I had a chance to talk extensively to Airstream Life contributors, including John Irwin, Forrest McClure, Dale Schwamborn, Michael Depraida, and Michael Lambert. Snapped a few good file photos, too. 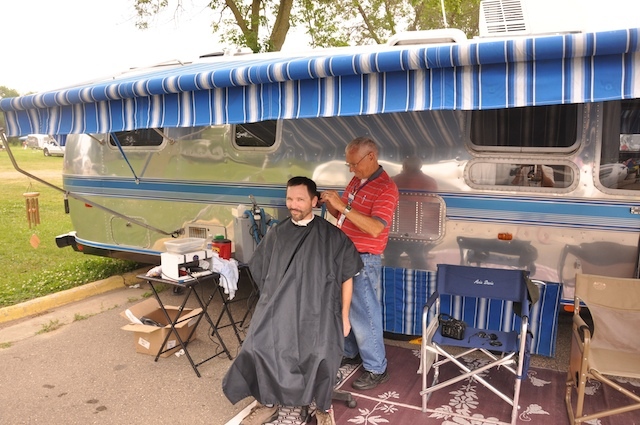 Toward the end of the afternoon I noticed that Airstreamer Freddie Davis was over at his Excella giving out haircuts. Now that we’re back on the road, I have to resume my mission to try offbeat barber shops wherever possible. What better place to start the experiment than in the shade of an Airstream awning? So I plopped myself down in his chair and got a pretty darned good $10 haircut — all proceeds donated to the church mission for which Freddie volunteers his time. I can recommend his services. 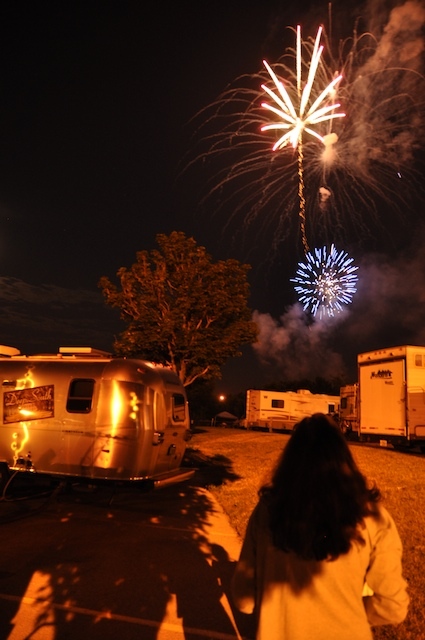 Tonight we are expecting fireworks over the state fairgrounds, which means that those of us parked in the campground will have a front-row seat. We’ve received warning notices to take in our awnings, because they might be charred by sparks floating down. Thus, our visit to Wisconsin will end with a bang, for tomorrow morning we will be heading down I-94 toward Chicago and around the southern end of Lake Michigan. I don’t drink beer, much to the disappointment of many, and I don’t own a motorcycle, much to the disappointment of myself. But I do like factory tours. So while in Milwaukee it seemed incumbent upon us to go to at least two famous production facilities: Harley-Davidson, and Miller Beer. Wednesday was designated Miller day (or as they repeatedly told us through the tour, “Miller Time”). The tour was fairly amusing because it started with the usual over-the-top propaganda film that has become the hallmark of factory tours everywhere. Whether Coca-Cola, Tabasco, Celestial Seasonings (tea), Tillamook cheese, Corvette, Nissan, or any other we’ve done, there’s always that introductory bit where they try to convince you that their product is not only a major part of American history, but an nearly spiritual experience. Just to be near it is to become a part of something much larger than oneself. In the case of Miller, the thing that really got us going was the reiteration of the phrase “Miller Time,” which (since I am an admitted beer cynic) particularly struck me as comical after about the 30th or 40th time I heard it. But the tour was admittedly well done, and I would recommend it to anyone who likes factory tours, or who likes beer. Like other factory tours, there is free product to be had at the end, and Miller’s samples currently take the form of three tall glasses. No skimpy paper cups here. The sheer numbers of production are staggering. This is only one of several plants across the US, and they ship massive quantities of beer to ten states. Imagine 2.25 million cases per week, going out on 250 trucks a day and something like 18 rail cars, too. Interestingly, they say that Chicago takes a large share of the production, equaling as much as five other states. Draw your own conclusions. 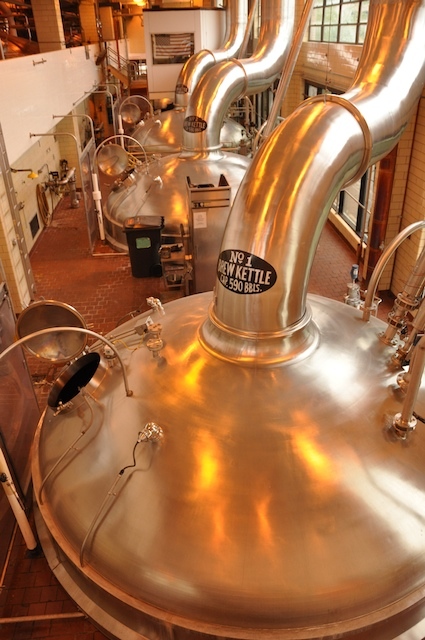 If you take the tour, you’ll see the movie, a filling and capping facility, a warehouse, the kettles, the historic “beer caves,” the Miller Inn, and of course the gift shop. For the price (free), it’s a heck of a deal. Harley-Davidson will be another day. We have one more day in Milwaukee, and I’m still working frantically on the magazine, so the current balance is about six hours of work and a few hours in the afternoon for exploration. We’ll probably catch the tour on Friday. On Saturday we’ll return to Madison for just the day, so we can participate in the WBCCI flea market, and then we’ll be on the road again.